After a month in Italy, we slipped into Austria today. There was the usual missing of our exit and backtracking, asking for directions, but, considering we didn´t have a Vienna map, we miraculously found the right house out of a million. It´s a cute attic apartment, with skylights, light-coloured wooden panelling with darker crossbeams, in a "studio" layout, a curtain separating our bedroom from Anica´s bed and the rest is. There was some snow still lurking on the lawns! Today, however, it was 11 degrees when we arrived. We´re at the far west end of Vienna, looking out across a field, to some hills across a river. It´s hardly like being in a city at all. German is a shock to read and attempt to speak, after three months of French-Spanish-Italian. German has some words in common, but many seem to be just like three or four words strung together. There´s probably a German term to explain that, such as "weputzdeesvurdztagever." Makes reading signs and labels difficult, though. As usual, we´re spoiled by the many people we´ve encountered who speak English, and do so pleasantly at the first sign you´re struggling with their language. OK, after a day in Vienna, I´m ready to say it´s one of my favourite cities in the world. It´s just so monumental, and yet so inviting. The public transport is great; our bus ride plus underground ride was no hassle at all. There´s all sorts of pedestrian streets, and the combination of architecture, art and music - especially music - make "Wien" wonderful. We had some luck early in the day when we went to the world-famous Spanish Riding School of the Lipanazzer stallions. Hoping just to see their museum, and maybe a practice session, there was a performance scheduled and we were able to get standing room tickets. Despite my mild asthma attack, and the discomfort of standing (before the show, too) it was an impressive thing to witness. Then we had a great lunch, involving schnitzel, doner, lamb kebab, lots of extra spices for me...very tasty. It was a restaurant called "Levant," so that suits our experienced taste-buds just fine. Taking advantage of our day-passes, although public transport is all on the honour system here, we took the #2 Tram ride, which follows a ring-road route tracing where the medieval walls once were. We saw all sorts of interesting buildings on this ride. The afternoon was mainly devoted to the Haus Der Musik. No translation of that needed, right? Jenn had seen this recommended for kids, and it was indeed a huge hit with Anica, but really with all three of us. 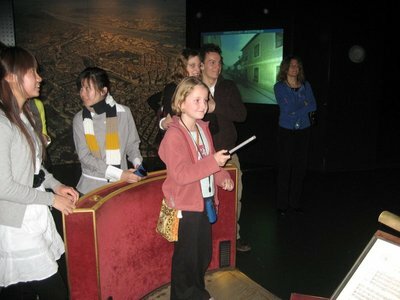 The core of the "kid" appeal was in the hands-on, science-of-music exhibits that let you play with sound waves, your own voice, pretend to conduct an orchestra, etc. 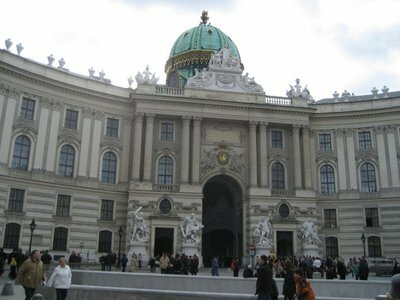 There´s also a series of rooms devoted to famous composers who lived in Vienna: Mozart, Beethoven, Strauss, Mahler, Schubert, etc. Each one is decorated with materials that evoke the time period and personality of the composer. Very well-done. Dinner was a stand-up affair! 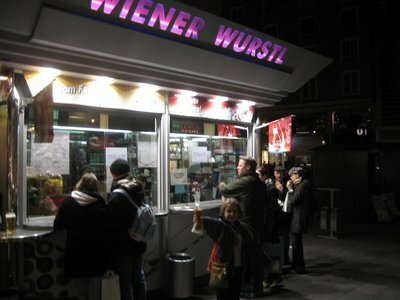 We ate at a "Weinerstanzel," or hot dog stand, we´d say in North America. Very yummy! All of us enjoyed it, and I particularly liked how they served their draft beer in a real glass. Like the transit system, very trusting of their patrons. To cap off the day, when I asked the bus driver if he stopped at our street, he merely said "yup," so we got on, knowing it was the right route. However, when we came to our street, he called out to us "76?" guessing our number, and stopped the bus right in front of it. To Anica, it was magical. How did he know? I guess that house is known as a tourist guest house, the only one on the block. Easter Sunday! And the Easter Bunny found Anica in Vienna. What a relief! As for the rest of the day, mostly it was a case of the Hapsburgs getting our money. Just like in the good old days of the Hapsburg Empire. We went to Schonnbrun Palace, the "summer palace" of the Austrian ruling dynasty. There were all sorts of things going on for kids. First, we did the "Kindermuseum," which is always for kids, but they had a little egg hunt added in. 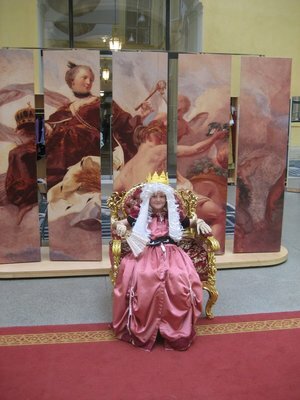 In this museum, Anica got to dress up in replica princess clothing, petticoats, wigs, and all. Then we explored how the royal children lived, including some of their actual apartments in the palace. In each room, an interlocking pair of wheels could be turned revealing pictures of how peasant children spent their days as compared to the Imperial offspring. A simple, but sobering visual tool. We ate at the Palace Cafe, which (surprise) wasn´t all that cheap. The food was good, though. Rain scared a few people off, so we were able to get in a shortened lineup, and go on the "Grand Tour" of the palace itself after lunch. Even the grand tour only takes you through 40 rooms....out of 1,441. There´s some amazing moments, as the audioguide tells you, "in this very room..." ...Mozart performed for the royal family at age 6, or ...the last Emperor signed his empire away on Nov 11, 1918; or ...Kennedy met with Kruschev in 1961...(bet you didn´t see that last one coming!). Aspects of the Hapsburgs being in-bred and foolish are mostly ignored, of course, although for anecdotal interest much is now made of Empress Elizabeth, aka "Sisi," who lived a life that has some parallels to Princess Diana. Easter at the "Summer Palace"
The other kid-focused thing going on was the Easter Market. The rain had stopped when we came out of the palace, so we looked through this, buying oversized pretzels and admiring the crafts. 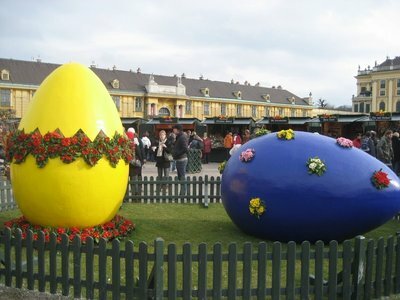 Giant, colourfully-painted eggs decorated the rows of temporary stalls, all set up in the square outside the palace. Definitely an Easter to remember! 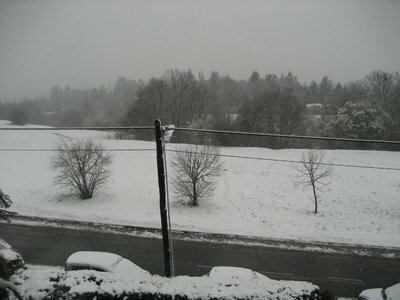 When we woke this morning, we were in for a shock...snow! Foolish Canadians are we, thinking we could go a full winter without seeing snow. It blanketed the three skylights of our attic apartment, covered our car, parked outside in the street, and whitened the hills all around us. Anica was excited about it. Snow! Soon, it was melting again, but Jenn had already declared she was staying home for the day to avoid the cold. She got some valuable peace and quiet, too, because Anica and I went out. 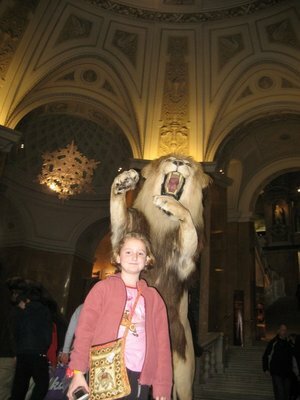 Anica was going to stay home until I said, "there´s a great Natural History Museum" in Vienna. Then she couldn´t wait to go. It was pretty good, too. Hundreds of stuffed specimens, of course, similarly exhaustive cabinets of rocks and meteorites, plus some great prehistoric objects, including the famous "Venus of Willendorf." That was housed in a spooky little "cabin" of its own, with horror-movie music playing in the near-dark. Not sure why! The Natural History Museum has a "twin," across the courtyard, called the "Kuntshistoriches Museum." The KHM. Normally, it´s closed on Mondays, but it was open today. Although not initially good news for Anica, who´d just put in three very enthusiastic museum hours (including a lunch break), but, again, when she heard they had an Egyptian gallery, we bought our tickets and made a beeline for it. Their Egyptian collection is good, but is a tiny fraction of what we saw in Egypt itself. Anica just likes spotting her favourite gods and goddesses and Pharaohs. Egypt has really made an impression on her. The KHM is best-known as an art gallery. We saw a special exhibit of Arcimboldo, the 16th century artist who did the composite portraits using fruit, etc. Especially cool were the still lifes that only looked like portraits when viewed upside down. The gallery had mirrors angled below the paintings so you could see them like this. Anica was going from room to room, looking for Brueghel. Ever since she saw his "Triumph of Death" at the Prado, she´s been fascinated by Pieter Bruehgel´s art. In our flat here in Vienna, there´s a big oversize art book of Bruegel. Eventually we got a room that was all his, and we saw many of his most famous works, like his Tower of Babel, the peasant wedding, Carnival vs. Lent, and his series on the seasons. I love it too, because there´s just so much detail you could look at one of his paintings for an hour. The one with the "230 children" playing "83 games" is like a visual record of 17th century Northern European childhood. We got home easily, on what I think must be the best public transportation system we´ve been on anywhere in the world. "Vienna, Austria...and a horse show"
Today we did a lot of stuff. First we went on an amazinly not busy bus, and a same-thing-as-the-bus metro. As we arrived at Karlsplaz we said: "do we want to just go to the Lipizzaner stallion museum?" So lucky! Even though the museum was closed we came up to the ticket desk and said: "Exersise?" "No, performence only." We got to go see a performance. Hmmm, it was, though, 80 inutes with 20 second peeks because of people in front of the boxs. They prance! They dance! They jump up from standing! They do anything! We had lunch, went to the Haus der musik. Can anybody guess what it means?! House of Music! We spent 3 hours! Some of the things you could do were: "Light wall: six terminals to the left invite zou to walk through various possible and impossible acoustic rooms"...so on and so on...My 2 favs were Harmonic driving. a sort of musical stay-on-the-path roller-coaster thing, and conducting with a baton, my own orchestra! I also liked the exibit on Franz Schubert! Guess what we had for dinner!? Stand-up German/Austrian sauseges! Amayingly good! So ate there, went home, G.N. Electronic orchestra conductor simulation at "Haus der Musik"
Today I woke up, felt around and went "The Easter Bunny came!" Yay! I got 28 miny choco eggs, 1 Pez, a giant suprise Barbie Egg with a miny Barbie doll, a dog, a leash, and a purse! We road the metro to Schönbrun Palace stop and when we got off we went to the Kids Mueseum. I dressed up as a Princess with a white/gray wig, a fan, and coulered gloves. I found the nest I wanted and got a toy. I got to play with imperial toys and layed a table where King Daddy sat. 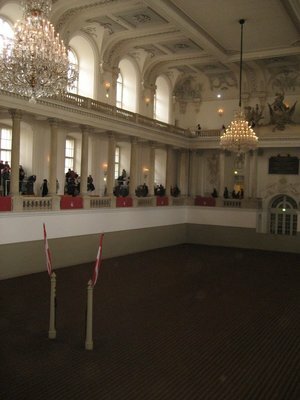 Had lunch and went inside the Palace where we went on a free audio guide tour through 40 intresting, decresptive rooms. Went home, had a lovely dinner home-cooked by Chef Mummy! G.N.! We woke up and it was snowing! Neat, neat, neat and neat. Actual snow! Me and Daddy decided to go to the natrul history mueseum. Without Mummy! We saw: jewelarry from prehistory, skealtons, aquariums, but stil the meany people stuffed the animals! Boooo! We liked it though and we had lunch on are own. Without Mummy! I think it's neat seeing the jewlarry because they didne't have to stuff them! Daddy was so suprised that its twin museum was open. we saw a whole room of Brugel with 4 pics I knew. Also had an Egyptian collectin. Went home, had dinner, G.N.! 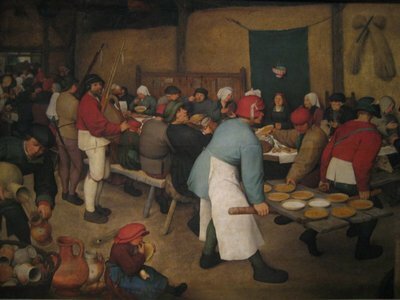 Detail from Brueghel' "Peasant Wedding"